Somewhere in their headbanging journey a bevy of smart rock critics seeking a token metal band to extol as encapsulating the rebel virtues of the music picked up on these plodding purveyors of car wreck chord changes and have argued in earnest that their by-number anger and angst is of greater merit than the inchoate whining and flailing it actually is. If they have captured the feeling of a generation, then it a mind-dead generation they represent; their music is a catalog of things most of us grow out of. They haven't a memorable riff, not a quotable line to shout in the car on the way to work, not a grunt nor a scream nor a rim shot that would agitate the nervous system to a creative frenzy. Metallica is the music of stalled traffic, tons of machinery grinding gears, moving nowhere. We're left to ask when will the drugs wear off the Hall of Fame's nominating board and they realize their terrible slight of motor city punk pioneers the MC5 and Iggy and the Stooges? Those are two bands who created a sound it took the rest of American and British bands over a decade to catch up with. Please, some sane choices for who deserves the pantheon for this insane music. But in this case, I agree...there are still bands and solos still out there, unrecognized. I think some folks confuse market success with talent. And as long as such doofuses are allowed on selection committees, these institutions have no credibility. There's still hope. The Aztecs predicted the world (as we know it) would end in 12/21/12...thus pre-empting Britney's eligibility. I'd agree that huge sales is a major , if unspoken, criteria for nominated bands and solo artists, thanks , no doubt, to the star-struck hands of Rolling Stone's publisher Jann Wenner. He has, in fact, decreed that negative record reviews are forbidden in is magazine, odd for a publication priding itself on it's independence of voice in the pursuit of honesty and truth; Wenner loves being associated with fame and power and loves being a legend maker. 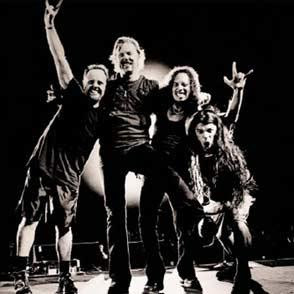 By any norman set of standards Metallica are merely an ordinary and unremarkable metal band who've hit the market at the right time. Their influence on the music that followed them, a much hyped standard for who finally gets inducted,is virtually zero. They did not, as is the case of the MC5and The Stooges, have a long-term that changed the sound of rock and roll and kept the form relevant for a younger generation. The 5 and the Stooges created something--punk rock, along with the Velvet Underground--while Metallica merely put a new paint job on an old model.